The Wyse 3030 LT is a cost-effective yet very secure thin client that offers outstanding performance for an entry-level device. The Wyse 3030 LT is a highly secure thin client with excellent multimedia capabilities and essential protocol and peripheral support including optional PCoIP. It features an Intel dual-core processor with integrated graphics engine for an exceptional user experience. It comes ready to connect to Citrix, Microsoft, and VMware right out of the box. Offering a wide range of connectivity options, it has four USB ports, including one USB 3.0 port, as well wired and as optional wireless network connections. The Wyse 3030 LT offers right-sized management for different use cases, onpremise with hands off file server with Wyse Device Manager, or cloud-based with Wyse Cloud Client Manager. The choice is yours. Either way, you can manage your thin client desktops across your building or around the world. Questions about the Dell Wyse 3030 LT Thin Client? We can help. For more information about the Dell Wyse 3030 LT Thin Client, or any of our products and services, call us at 1.800.457.8499 or email us. 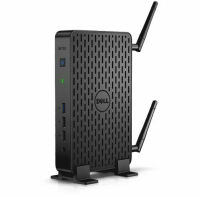 Order your Dell Wyse 3030 LT Thin Client today. Order your Dell Wyse 3030 LT Thin Client now. Your purchase order, with credit approval, is welcome, as well as all major credit cards, PayPal and Google Checkout. Remember, you'll get FREE technical service with every product you buy from Vecmar.